What do all of these phrases have in common? One thing comes to mind: The desire to have better looking grout. Grout lines are the thin lines in between the floor tiles. If you are tired of looking at your discolored grout lines and you are thinking about making a change, continue reading more about grout staining, colored or painted grout lines. Sanded grout is a porous material and even under the best conditions will become soiled and stained. Our product, ColorSeal, will eliminate this problem by sealing and coloring your grout. ColorSeal guarantees that you will have a beautiful consistent colored grout that resists stains from food, drinks and dirt. ColorSeal contains concrete hardening agents, granite resins and urethane. It has the consistency of pancake batter which fills in and closes the dirt trapping pores of the grout. It also contains mildicides to provide a sanitary surface for years. It can be made in any color and will completely waterproof the grout surface. 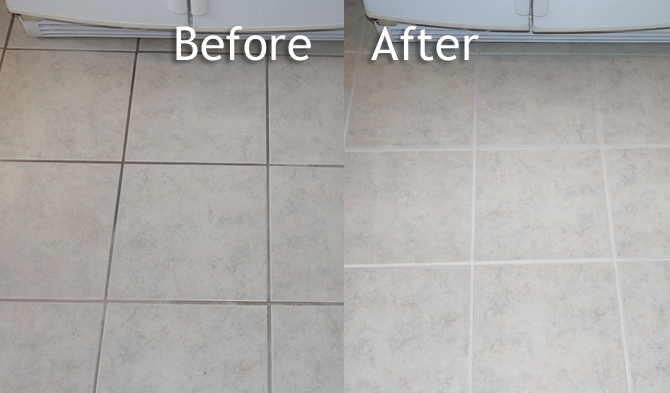 Our cleaning and color sealing process restores your soiled grout lines to a beautiful “like new” appearance. If you want to lighten up your grout, or even change the color, we can do that as well. We will work with you to get your floors to look exactly how you want. In fact, we will actually test the color seal on your grout lines so you can feel confident that you are making the right color choice. We can protect new and old installations alike. In the long run this process saves you time, money and keeps you from scrubbing your grout lines on your hands and knees. So avoid expensive regrouting and even the mental fatigue of ugly grout. 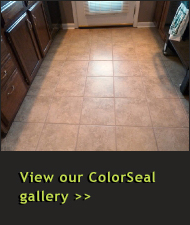 Let our ColorSeal restore your grout lines to “like new” condition with ALL the additional advantages.